Liberty fabrics are really beautiful to work with. These three prints are some of their classic designs that have been around a long time. I usually put a little bit of Liberty into each quilt that I make. Furthermore when Kate from One Flew Over posted her finished quilt this week, I was overwhelmed by the urge to pull out my red and blue/aqua fabrics for my next project. I have a thing for quilts made with linen at the moment and this quilt really appealed to me. I am easily led astray! I haven't as yet decided the on the design of the quilt, but would like to step outside of my current square mode. Can you imagine these triangles with a linen mix...delicious! Like those fabrics you have stacked up. Yes, I know about being easily lead astray....you just did it to me! Oh, you got into trouble from Mary, I see! Divine fabrics, not sure about working with Liberty in quilts, though? I have a few of the reds and have also acquired a few linens - looking forward to hearing how you feel about mixing them - please remind me to look, if you can remember! 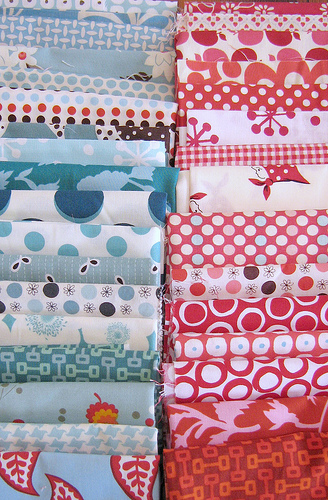 Um, is it wrong that I had complete fabric envy looking at that collection? Seriously, I had to restrain myself from going online and impulse shopping. :) Beautiful. 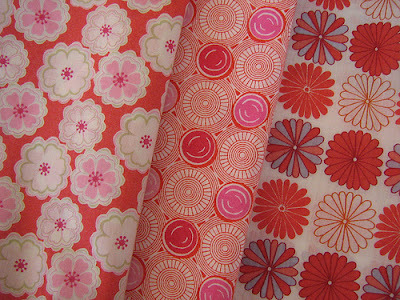 You must have been reading my mind...I was wondering where the pink floral (on the far left side of the Liberty Tana-Lana picture) was from when I saw it in your pink and orange baby quilt. I have a J Crew skirt in that fabric and absolutely adore it! Those reds and blues are going to be amazing in your quilt! Yummy fabrics, I love them. I love the linnen you use in your quilts. What kind do you use? I bought some lovely linnen from Denmark, but I was unpleasantly surprised by the price! I can't wait to see what you come up with, with these fabrics. They are lovely. I'm also a big fan of liberty fabric. I love her quilt in the red and blue, too! As I scrolled down your post, I actually said oooohhh - when I got to your fabrics. Can't wait to see what you come up with, especially if it is non-squares. I would love some good inspiration.